The more curious and open I have become about my feelings and where they come from, instead of just trying to redirect or stuff them down, the more I have learned about myself and my genuine desires for my life. A few weeks ago (I started this post a month or two ago), I was walking the dog a little later than usual and he wanted to go down a dark alley (yea, the dog is in charge of where we go on his walks, what can I say) and I suddenly felt a new, unfamiliar fear. Well, not totally unfamiliar, but a fear I hadn’t felt in a couple of decades. I became aware of something I had always known, but was too ashamed to verbalize: until recently, I really didn’t value my life. I can’t really pinpoint this belief to to any particular time or specific event, although there are some incidents that make sense in retrospect. I never wanted to be responsible for my own death, but (especially when I was feeling particularly low) I would fantasize about accidents tragically rescuing me from what felt like a dark, inescapable hole of a life. I feel sad now, when I think about all the time I spent feeling so desperate and so broken, that I would hope for something so horrible. I feel shame about the selfishness of it and the pain it would have caused the people who loved me, something else I couldn’t quite fathom at the time. Is this fear real? Now that I’m not afraid to exist, does the familiar feeling of fear have to attach itself to something else? Am I so used to the feeling of fear that I don’t know what or how to feel without it? Where does the fear go, when it has nothing to attach to? What am I specifically afraid of? Death itself? Whatever comes after life? Something else entirely? In asking myself these questions, I found that my greatest fear is regret. Regret about leaving things unsaid. Regret about not having made the impact I believe I am capable of making. Regret about not finding and fulfilling my purpose, or squandering my unique gifts, whatever they may be. 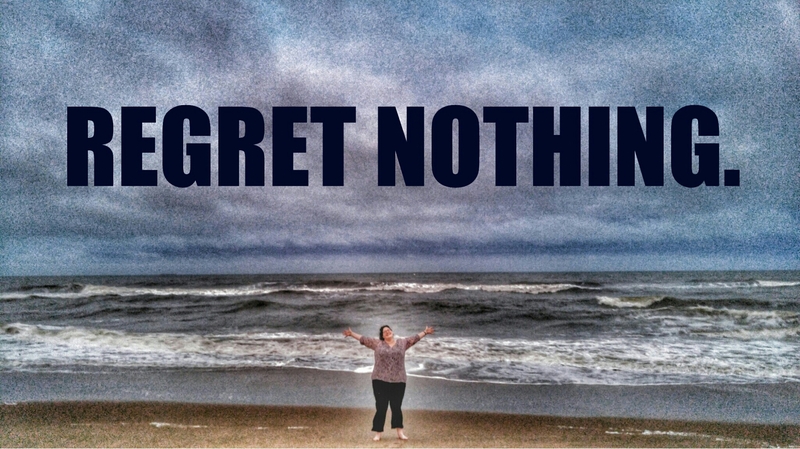 Once I had identified that REGRET is my core issue, I started thinking about how I could live a regret-free life. I thought back to my last post, about living in the moment. I thought about avoiding “deferred happiness,” the false belief that happiness is somewhere in the future, when I finally [fill blank] (examples: lose weight, get a degree, find a partner, get my dream job, make more money, the list goes on and on). I thought about openness and vulnerability. I realized if I speak my heart in every moment, instead of waiting for a more appropriate time in the future, and if I do work I am passionate about NOW, instead of waiting for a more convenient time, a time when I imagine I will be more “ready” (let’s talk about that lie some other time), then there will be no regret to fear and late night walks don’t have to feel scary. This was also the day I decided to give notice at my fancy corporate job, to return to school and start working on a career that fills my heart space with passion and purpose. More about this soon. This entry was posted in Uncategorized and tagged death, fear, fear of death, life, purpose, recovery, recovery journey, regret. Bookmark the permalink.